San Antonio Car Accident Attorney | Get a Free Accident Consultation! Injured in a car accident? Call our San Antonio accident attorney today! Were you or a loved one injured in a car accident? Determining who is responsible isn’t always easy and sometimes getting fair compensation is even harder. By contacting a lawyer, you gain an advocate on your side who checks the facts of your case and helps you make the best decisions moving forward. Our firm handles cases in San Antonio and all over the great state of Texas. We have the experience to fight for the compensation you deserve. Contact our San Antonio office today for questions or to schedule a free case evaluation, 210-960-3939. Justin has recovered millions in damages for past clients. He is a native of Texas and has helped clients across the state since 2007. Accident cases are taken on a contingency basis. You only pay if we win! 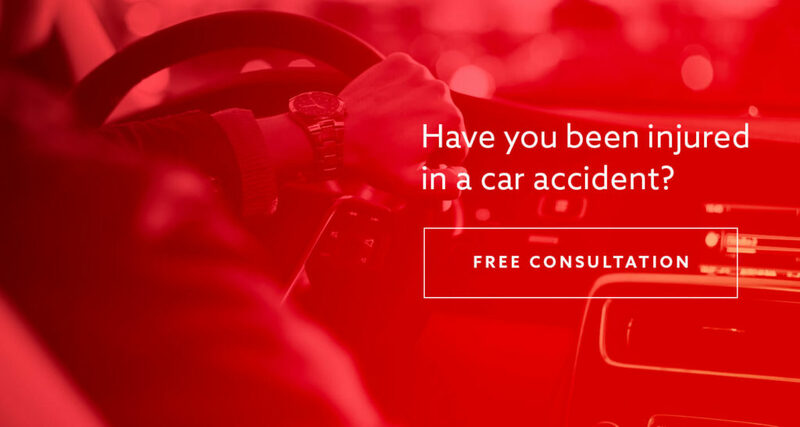 All car accident cases get a free consultation. Why do I need an attorney after an accident? Who is the best accident lawyer near me? Types of car accidents we handle. What are car insurance requirements in Texas? What are the most common injuries in car accidents? Do you have a case? Ask our accident attorney. If you are able, call 911 to report the accident. Immediately seek medical attention for any injuries. When the police arrive, give them a full account of what happened, with as much detail as you can. Include every detail possible, including the possible odor of alcohol or whether the other driver was distracted by their phone while they were driving. Get a copy of the police report as soon as you can and make sure it is accurate. Do not give any statements, written or recorded, to anyone, especially the opposing driver’s insurance agent. Get the names and contact information for the driver and any potential witnesses. Take pictures of the scene and your injuries. Speaking with insurance companies, guiding you through the process, and advocating on your behalf. Using our expertise to sift through the evidence, evaluate police reports, and interview witnesses. Estimating fair compensation based on the severity of the damage and your injuries. Ensuring that you are getting the best deal possible based on the facts of your case. Taking the responsible party to court if necessary. The simple answer is it is never too soon to hire an attorney after a car accident. The at-fault party’s insurance company will contact you right away for a statement. The insurance company is not looking out for your best interests. They will do everything in their power to not pay you what you deserve. Consult with an experienced car accident attorney at Hill Law Firm before giving your statement. Having a lawyer deal with the insurance company will maximize your financial recovery and protect you from unfair insurance practices. In Texas, the statute of limitations for lawsuits related to car accidents is two years. A statute of limitations is a law that restricts the amount of time you have to file a lawsuit against another party. After two years have passed since the accident, you will no longer be able to file a claim to recover compensation for your injuries. The sooner you contact an attorney the sooner they can get started on filing your claim. Two years may seem like a long time, but when dealing with a serious injury, it can go by fast. You are not charged a dime unless we win. There is no risk to you. Our attorneys work on a contingency fee basis. You will pay no costs or legal fees unless we obtain compensation for you. Our firm will cover all of the upfront costs associated with filing a lawsuit. We can even help you with your medical bills. When you hire Hill Law Firm there will be no out of pocket expenses for you. Our goal is to ease your concerns by taking on your burdens. Compassionate – One of the most important characteristics, as you are in one of the most painful and stressful situations of your life. The best attorney will be empathetic about your current state and understand your suffering. Responsive – You need an attorney who is 100% focused on your case. They should respond swiftly to your questions and concerns. Involved – The best attorney is involved in every aspect of your case. They won’t pass it off to let staff members such as paralegals and legal assistants. Experience – Your lawyer needs a solid track record of success against auto insurance companies. They also need experience prosecuting car accident cases like yours. Positive Reputation – The best lawyer will have positive testimonials from past and current clients. They should also be recognized by their peers for their achievements. Car Accidents happen every day and can lead to life-altering injuries. Over 200,000 injuries occur every year throughout Texas from crashes, which is an injury about every two minutes. Fault in car wrecks is often disputed and insurance companies do not always have your best interest at heart. What happens when your claim is denied? You need an experienced attorney who will stick up for you and fight for your rights to compensation. There are two types of insurance law: “fault” and “no-fault.” Generally, each state adopts one or the other. Texas has a fault-based system in effect, like the majority of states. Fault-based insurance law holds the at-fault party liable for compensating the injured party. Insurance companies will determine who caused the accident. Then the at-fault driver’s insurance agency will be responsible for providing coverage for the other party’s medical care and property damage. It is optional to increase coverage amounts. If the severity of injuries and property damage is extensive, then the compensation required may exceed these minimum liability amounts. If this occurs, then the injured party has the option to bring suit against the at-fault driver for the difference. Texas does not require drivers to purchase uninsured/underinsured motorist (UM/UIM) coverage. Many people choose not to carry it because of the extra cost. However, it can be an invaluable asset if the at-fault driver doesn’t have enough insurance to cover your damages or is not insured at all. You will need to prove fault on the part of the other driver in order to collect under your UM/UIM provision. An attorney can help you collect the necessary evidence to convince your insurance company of the uninsured driver’s negligence. Texas experienced a decrease in the number of motor vehicle traffic fatalities. The 2017 death toll of 3,721 was a decrease of 1.92% from the 3,794 deaths recorded in 2016. In 2017 there were 761 people killed in crashes occurring in intersections or related to an intersection. There were no deathless days on Texas roadways in 2017. 254,853 persons were injured in motor vehicle traffic crashes in 2017. Pedestrian fatalities totaled 614 in 2017. This is a 9.7% decrease from 2016. Pedalcyclist fatalities totaled 57 in 2017. This is a 13.6% decrease from 2016. In 2017, there were 1,024 people killed in motor vehicle traffic crashes where a driver was under the influence of alcohol. This is 28% of the total number of people killed in motor vehicle traffic crashes. *Data retrieved from The Texas Department of Transportation – Texas Motor Vehicle Crash Statistics – 2017. We analyzed the data provided by The Texas Department of Transportation for 2017 to see the difference between car accidents in Urban areas vs. Rural areas. 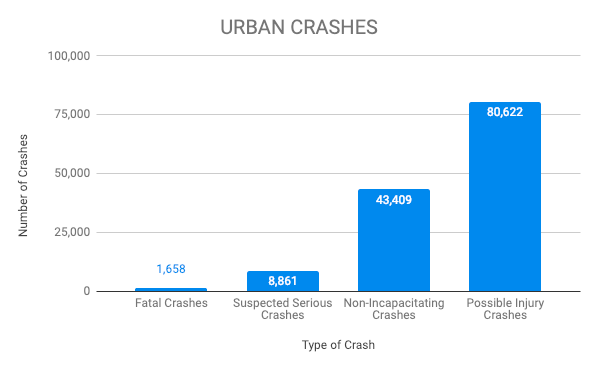 As shown in the charts below, car crashes are 4 times as likely to happen in Urban areas given the vast change in population sizes. 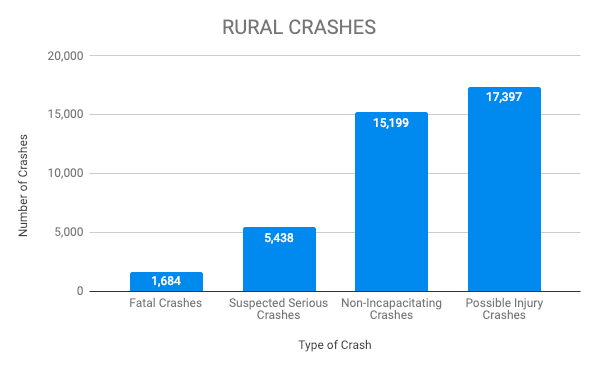 What we found unfortunate was the fact that crashes that end in a fatality are almost the same number for both Urban & Rural areas. That means it is 4 times more likely to be in a fatal crash in a Rural area than an Urban area. Being injured in a car accident can turn your world upside down. Don’t take on the insurance companies alone. Justin is a Top 40 Under 40 Lawyer according to The National Trial Lawyers and has won many successful car accident verdicts over his career. Call Hill Law firm today and schedule a free consultation to discuss your claim.